To cope with the increasing demand on the high speed performance Panel PC, Winmate Communication launched the second generation of 5.7" ~10.1" HMI Panel PCs, powered by a 1.6Ghz Intel Atom N2600 processors. After our successful first generation of panel PC that used 1.1Ghz Intel Atom Z510 processors, we want to fulfill the customer’s dream with high performance processor. The Atom N2600 chip and NM10 chipset will speed up this panel PC performance, it will make HD video playback and slide shows flawless. Front bezel design will support this panel PC in harsh environments. These Panel PCs are also available in IP65 product series; allow users to use in harsh, wet and dusty environment and applications. 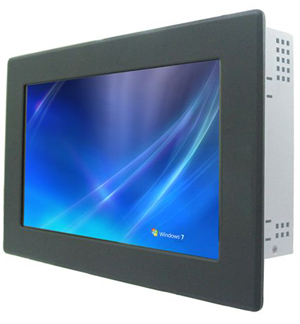 Winmate also offers our users with the PoE solution for 7” (W07ID3S-PMA2PD) and 10.1” (W10ID3S-PMH1PD) Panel PC. This PoE will safely transfer electrical power along with data, to remote devices over standard category 5 cable in an Ethernet network. PoE gives users a safer solution to prevent possible data loss or system damage from sudden cut-off of power supply.